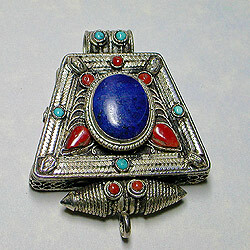 An antique elaborate silver design, I believe from Nepal, is the setting for the center raised lapis oval and coral/turquoise accents that comprise this exotic pendant. The thick sides feature tiny openwork "o's" as well as one coral stone. The opening at the top highlight two turquoise stones. The bottom double cones with coral accents end in an open loop so you may add a dangle if you so choose. The back is finished in a hammered shiny sterling with the stamped numbers "925." Use with a chain or hoop and wear with lots of fashion options. Looks fab with jeans as well. It measures almost 2 1/2" in length, 1 1/2" in width and is in excellent condition.